The presidents of Klamath Community College, Oregon Institute of Technology, Southern Oregon University and Rogue Community College share a laugh during a forum announcing the creation of the Southern Oregon Higher Education Consortium. 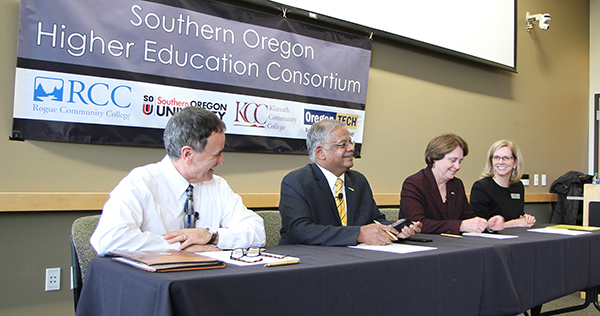 The presidents of four public colleges and universities in Southern Oregon joined forces today to create the Southern Oregon Higher Education Consortium – an alliance aimed at streamlining students’ educational pathways and addressing the region’s specific workforce needs. A memorandum of understanding signed by the presidents of Klamath Community College, Oregon Institute of Technology, Rogue Community College and Southern Oregon University calls upon the consortium members to “promote innovative outreach and educational activities.” It specifically directs the institutions to share information, collaborate on complementary programming and facilities, and work cooperatively on professional training, technology and programming. “Enhancement of the student pipeline and improvement of degree-completion metrics will be areas of particular emphasis,” the memorandum said. 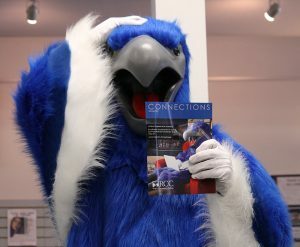 The new consortium – first envisioned a year ago by the four presidents during a lunch meeting halfway between the Rogue Valley and Klamath Basin – will be announced during signing events at 10 a.m. today at KCC’s Founders Hall in Klamath Falls, and at 2 p.m. at the RCC/SOU Higher Education Center in Medford. The four presidents will discuss their interests in the collaboration during the Klamath Falls event, and will participate in a panel discussion at the Medford event. Randy Cox, executive director of the Klamath County Economic Development Agency, will speak at the Klamath Falls gathering. John Tapogna, president and partner of ECONorthwest, will discuss his organization’s recent report, “Oregon Talent Assessment,” as part of the Medford announcement. The consortium is Oregon’s first regional coalition of colleges and universities. It is viewed as a pioneering step toward preparing sSouthern Oregon’s students and workforce for a rapidly changing future. Cannon commended the four presidents for “strategically joining together as a coalition to advance the specific pathways necessary for their regional communities to thrive.” The consortium is expected to prompt discussion about what kinds of economic growth are needed in Southern Oregon, what industries the institutions should help support or attract, and how higher education can best align to meet those needs. The consortium also provides a unified voice for higher education in Southern Oregon, and will advocate for the region’s priorities in conversations with state and federal lawmakers. Regional grants and other combined resources are likely outcomes of the partnership. “What excites me most about this consortium is the ability of all four institutions to work together to build a regional college-going culture that will transform our economy, strengthen families, and inspire others to pursue their dreams,” said RCC President Cathy Kemper-Pelle. The new consortium will be an exercise in the power and flexibility of partnerships. The institutions – which already have shared academic strengths in areas including business, sustainability and healthcare – are open to exploring cooperative programs in various areas that will best serve their region and state. “Our students, industry and business partners, and our communities all benefit through our collective voice for Southern Oregon – a vibrant consortium of action focused on education, workforce and regional economy,” said Oregon Tech President Nagi Naganathan. The four colleges and universities have a long history of working together to meet the needs of students and employers. Together, the institutions enrolled 26,600 students in 2017-18, and conferred a total of 3,370 college or university degrees.